Want to keep bags clean, safe & off the floor? Get The Bag Fix™ Here. 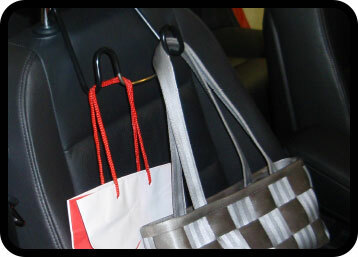 The perfect solution for hanging purses, laptops, or anything that you can hang off your car’s headrest! 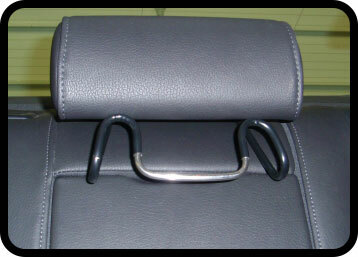 “The Bag Fix”™ fits easily between the posts of your vehicles headrest on almost any car or truck. It’s strong enough to hold shopping bags, coats, brief cases, laptop bags, or workout gear and holds over 20 pounds. 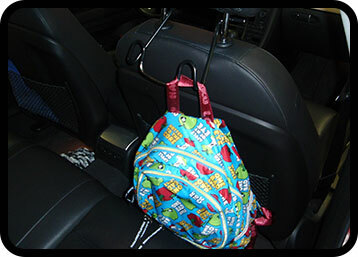 When children are in back “The Bag Fix”™ is the ideal hook for having your purse in front for drive thru’s or easy access to a diaper bag. Keep your bags off the dirty floor and still have easy access when you reach your destination. For children, this hook can hold bags of their favorite toys and keep them organized. 5/8 inch (16mm) or less. Lauren Fix's “The Bag Fix”™ is lightweight, strong and made of stainless steel. It’s a travel essential!